Most people have successfully lost weight at some point in their lives. However, people's success at maintaining that weight loss is another story. When you look at clinical trials of long-term weight loss maintenance, the numbers don't look so good. Approximately 10-20% of subjects are able to maintain a weight loss of at least 5% after 5 years. The results of other research also look grim; five years after completing structured weight loss programs, people only maintain a 3% weight loss. The problem with clinical trials, however, is that they may not reflect what is going on with the typical U.S. citizen. A recent study used data from the National Health and Nutrition Examination (NHANES) survey to get an idea of the success rates of the average person in the U.S. The researchers looked at data for 14,306 people between 20 and 84 years of age, from the years 1999 to 2006. They defined "long-term weight loss maintenance" as having maintained weight loss for at least 1 year. They excluded people who had never been overweight or obese. You can see that over 35% of people were successful at maintaining a weight loss of at least 5% for more than a year. On average, this was a 29 pound weight loss. The numbers drop off from there, with only 17% maintaining a 10% weight loss. However, of the people in that 17%, the average weight weight loss maintained was 42 pounds. The research involved self report of body weight, which could introduce bias because people tend to under-report their weight. Also, since this data was based on individuals trying to remember their past weights, there could be recall bias. However, there is some research to indicate that, on the whole, recall of past weight is reasonable stable over time. So recall bias probably does not affect the results of this study too much. The researchers were not able to determine the method of weight loss. Thus, the data could include people who had unintentional weight loss due to illness. Since this was a cross-sectional study, the researchers could not determine when the weight loss occurred. The researchers also could not determine whether the people who had large amounts of weight loss underwent bariatric surgery; however, the number of people who have such surgery is very small (only 39 per 100,000 people), so this probably did not affect the results. The biggest limitation of this study is that the researchers only looked at one point in time. They only had data on the people's current weights, maximum weights, and weight 1 year ago. That's a lot of missing years that remain unaccounted. Thus, there was no way to determine the number of years people had maintained their weight loss. Still, the study does give at least some idea of long-term weight loss success. For example, someone who had a maximum weight of 220 pounds, went down 165 pounds two years ago, and then went to 185 pounds, would be classified as having 10% long-term weight maintenance in this study. While the person certainly regained some weight, he/she didn't regain all of the weight, and thus are still more successful at weight loss than if he/she had gone back to a maximum weight. Overall, the data does suggest that may do a bit better at maintaining long-term weight loss than clinical trials indicate. Still, if only 17% are maintaining a 10% long-term weight loss, that means 83% of people are regaining most, if not all, of their weight back. Those aren't good odds. 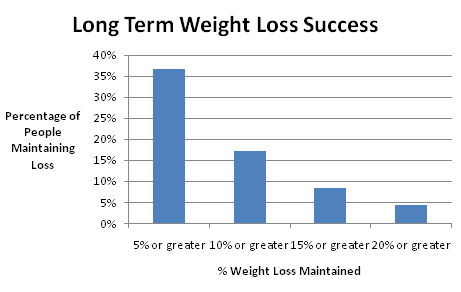 While the statistics are grim, it doesn't mean that you can't be successful at maintaining long-term weight loss. But long-term weight loss requires effort, and an effective strategy. If you are someone who has struggled with maintaining weight loss, you can contact me for online consultation. I am also available to speak to groups and organizations on effective strategies for maintaining long term weight loss. With appropriate lifestyle modifications, you can be in that 17%. James, I just came across this post, and I think that the stats from either study indicates one of the main problems with fat loss: maintenance. I’d contend that the @ 83% who regain do so because their “sole” goal is fat loss while maintaining their losses is many times an after-thought, unfortunately. As I’m sure you tell your clients, fat loss is simple (i.e., create a consistent calorie deficit), but the true work starts with striving to be part of the 17% crowd … for life! Excellent point, Muata. When I worked for the weight loss clinic, we always helped our clients plan for the maintenance period, as the maintenance period is just as important as the weight loss period. But, as you state, too many people focus on just the weight loss and don’t think about what they’re going to need to do to keep it off long term. There are terribly few resources out there addressing maintenance, relative to losing weight in the first place. I’d like to see that changed. However I just need to clarify something- the weight loss maintained, is it, 10% of the starting weight or 10% of the weight lost? E.g. Is it 10% of someone going from 200lb down to 180lb or 10% of the 20lb that was lost? Yes, I’m not sure where the “98%” figure comes from as I’ve heard that figure before as well. In fact, the CEO of the weight loss company I used to work for spouted that figure all the time, despite the fact I couldn’t find any evidence to support it. The weight loss maintained is 10% of the starting weight. So 10% would be someone going from 200 lb to 180 lb. Thanks for the excellent article James! I definitely agree that for most people wanting to lose weight, the easiest part usually is losing the weight. By far the biggest struggle is to sustain it. I believe part of the explanation may be, that new lifestyle habits that needed to be solidified during weight loss, most of the time is not. Therefore people easily tend to slip into old habits, when the new “healthier” ones have not been established completely. But yes it is a complex situation and there are no simple solutions to it. Again thanks for the great content!